Display Tuner provides convenient access to the monitor settings, such as brightness, contrast, color settings or geometry. If your monitor has speakers or a microphone, Display Tuner will allow you to change their volume easily. You can define several profiles with different color settings (for example, "Films", "Text", "Games") and Display Tuner will allow you to easily change the color settings, just press a hotkey! There is no need to use the OSD of the monitor anymore, Display Tuner is a much more convenient tool! Display Tuner supports all monitors whose settings can be changed from Windows. It works in Windows 2000/XP/2003/Vista and it supports almost all video cards: nVidia, ATI, Intel, S3, SiS, Matrox, etc. 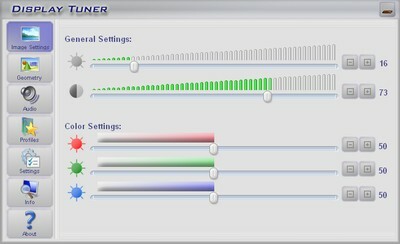 Display Tuner supports all monitors whose settings can be changed from Windows, not monitors of only one manufacturer. 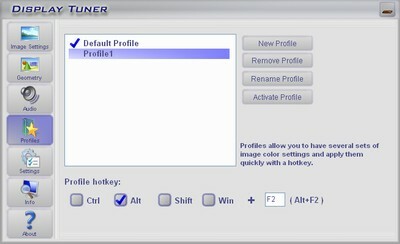 Display Tuner allows you to have several color profiles and easily switch between them using a hotkey. Display Tuner starts faster and it can be minimized to the system tray. Display Tuner is free for noncommercial use. Please contact us if you want to use Display Tuner in commercial purposes.